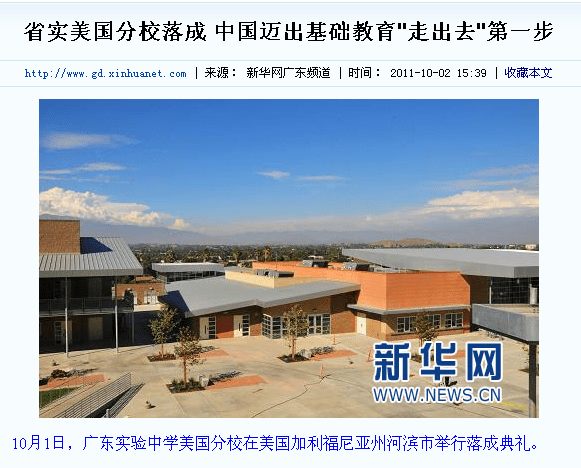 Guangdong Experimental High School (广东实验中学) announced that not only had it completed 3 new campuses within China, but was proud to be opening the very first Chinese managed public school in Riverside, California. The move was heralded as China’s first step on to the world stage for promoting its unique style of education and overall quality. Even better, it was opened on National Day, and would soon be opening up to enroll Chinese students. This new campus/program was made possible through a relationship with the Chemax Educational Foundation, which was authorized by Guangdong Experimental High School to establish a branch in the United states. Former Secretary of Education for the state of California, Dr. David Long, had even been on hand for the ceremony, and according to the article, was very excited by the partnership with Guangdong Experimental High School, the Guangdong Provincial Department of Education, and a Chinese-American owned foundation, Chemax. Dr. Long was quoted as saying that the Chinese managers of the school were “imaginative” and that the school would be “very popular”. 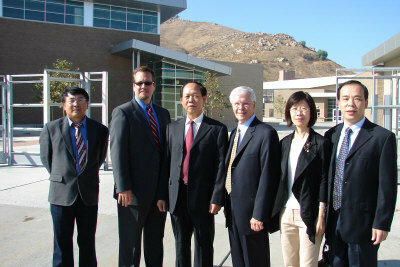 Dr. David Long with Guangdong Experimental High School leaders and representatives from the Guangdong Education Bureau. 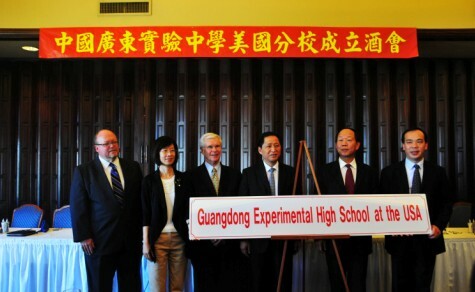 Sign translates as "China's Guangdong Experimental High School American branch establishment celebration". It was so important in fact, that Xinhua even had reporters on the scene (their coverage in Chinese or google translated). They fawned over future Chinese culture programs and the possibility of Kung Fu classes. Finally, American children would get to experience education with Chinese characteristics. A local student, Sarah, said that the Chinese students from Guangdong Experimental High School were the best in the class. The new campus included classroom space for 1,300 students, basketball and tennis courts, baseball fields, etc. Everything you would expect in an American public high school. The articles all made it clear, this was a chance to attend an American high school (Chinese link), and that this school was opened by Guangdong Experimental High School. Apparently the school leaders though were a bit too imaginative, and as it turns out, the entire project was fake. Several alumni from the school contacted me with evidence they had gathered that posed serious questions about the relationship between Guangdong Experimental High School and Hillcrest High School. The most important piece of evidence though is this USA Today story groaning about the fact that Hillcrest High School wouldn’t be opening in the 2011 school year due to budget cuts. Alvord School District also confirmed by phone that there was no such partnership. The district also stated that an earlier proposal by Loretta Huang (cited by Dr. Li Chen as evidence that the program was moving forward), was nothing more than a two-minute talk during an open forum at a school board meeting. There had been no formal presentation, nor was there further discussion of the plan (Alvord District report from that meeting). 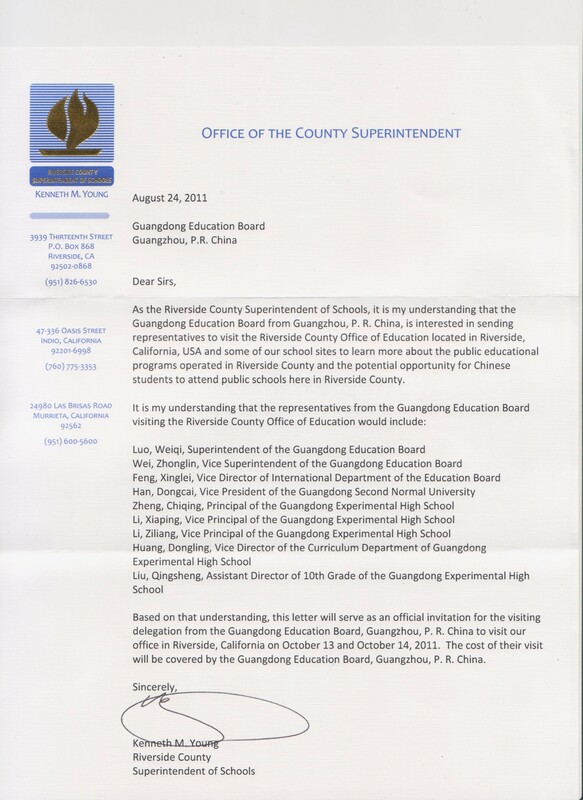 I also contacted the Riverside County Office of Education and the superintendent’s office confirmed they had sent a letter of invitation to the Guangdong delegation but due to scheduling problems, there had been no meeting with the superintendent during their trip. There were also no plans to further discuss the possibility of a partnership with Guangdong Experimental High School. Dr. Long told me by email that he had simply been invited to visit the school with Chinese educators, but was insistent that there was no partnership with either Chemax or Guangdong Experimental High School. Dr. Long currently runs an educational consulting firm, and was an unofficial guest. He was under the impression that this was a visit to promote future educational exchanges, but was unaware that it had been spun as an actual agreement. Chemax Educational Foundation, headed by Dr. Li Chen, doesn’t seem to be the only company operated by Dr. Chen. In fact, Chemax International, which has the same registered address, sells automotive parts (owned by Li Chen). The same office is used as the headquarters for both Green Oak Academy and Guangdong Experimental High School at the USA, both operated by Dr. Chen. When contacted, Dr. Chen insisted that this was all the result of a cultural misunderstanding, and that there were indeed plans to begin sending students to public high schools, including Hillcrest when it opened. However when Dr. Chen was first confronted about these problems he maintained that the school would be opened to Chinese students, and that 20% of the total number of students at the school would be foreign students selected by Guangdong Experimental High School (Chinese or Google translated). From other documents, and photos from Chemax Educational Foundation’s Flickr stream, it seems that the programs it is running is a small private school, possibly run out of residences, meant to seem like an actual American public school to the Chinese parents who would be sending their kids across the sea. This was something I could not confirm with Dr. Chen, but these photos could relate to his Green Oak Academy. Just yesterday one of my wife’s students told her that he was considering an opportunity to work in the US for a Chinese-American company. It sounded strange. For 10,000rmb he would be flown to the US, get approved for a visa, work for two months (with food and lodging provided) and have a month to travel as he pleased. It sounds too good to be true, especially since he would be working in a restaurant for an unspecified number of hours each day without any further payment. Chinese parents should be exceptionally alert when choosing an American school for their child to attend. A school diploma has little value when there is no accreditation behind it. Many of China’s new middle class are desperately searching for ways to send their children abroad, but schemes like this hurt students and families while enriching a few with connections. By T in Education on October 13, 2011 . A little while ago I was hired to interpret for a Chinese artist who was holding a talk at the Asian Society here. At the meeting, there was a former secretary of agriculture, an official from the State Department, etc. The artist, with darting eyes like laser beams, sent his camera man running after these people and other American guests to “make sure the blond-haired-and-blue-eyed people shown in the video.” I could see very well how he would be spinning this glorious event in front of Chinese audience for personal gain. The event, in the flier, was billed as a cultural exchange event in which the artist would be talking about the respectable subject of public diplomacy. I have words for current and former American officials or dignitaries (whatever that means): Don’t be so dumb as to be used as a prop by Chinese con men–they are everywhere. What it appears to you is often not what it really is, and a little dose of suspicion will go a long way to keep America, if possbile, from being invaded, and corrupted, by frauds of all kinds and all manners. Back to my theme of “Dumb Americans” again. As i was reading Tom’s post i was thinking about us dumb americans, wo men mei you xin yan. Reminds me of my blond Danish friend who was hired by a Beijing company to attend a business meeting in a suit but not to say anything, which wouldn’t have been hard since he had no idea what they were talking about. But he was the Lao Wai to add credibility and worldliness to the company and impress the meeting attendants. He was paid 200 RMB for a half hour work. Yaxue wrote Dumb Americans, but it absolutely applies here. I guess now it’s better to send them out of the country entirely to get that “international experience”. This story actually appears here in English for the first time, and in more detail than any single Chinese post, so I’m pretty excited about it. Good find, Tom. I’m not entirely surprised by this, but it’s good you got to the bottom and exposed this for us to read. It’s a good warning for others not to eat everything any company or school sets in front of you. When things are too good to be true, they usually are. Wow, I was shocked by the audacity of Chinese officials who think they could get away with this. Of course, if people on the school board gloss over it, then the officials have gotten away with it. This was the first time I have heard of this. This just shows us why “white-face” abilities should not be squandered. I have seen articles for scams like this before, all run by Chinese or returned Chinese. As for us non-chinese, abc, and bbc, let us make sure that we keep our business tactics and social actions ethical so we can keep that little halo above our heads that truly does bring multitudes of benefits in the mainland. In the 《羊城晚报》(Yangcheng Evening News –Yangcheng is another name for Guangzhou) link Tom provided, Chen Li (陈立）is presented as “美国加州教育委员会办公室主任”, or the Administrative Director of California Education Commission, USA. Is there such a Commission? If so, is this man its “Administrative Director?” If there is no such Commission, or no such Director, is he breaking the law by telling this lie in China? California now has a lot Chinese-American-run “agencies” that help Chinese pregnant women come to the US to give birth to their babies and thus automatically obtain Ameircan citizenship for the newborns. Have you heard of that? I’ve heard of the agencies you mentioned in your last paragraph, Yaxue. When asked the question, “Where are you from?”, many of the students I once taught would respond “I’m from America/Canada/Australia.” I assumed they hadn’t been in these countries long enough to go through the processes of acculturation and language acquisition, given that they spoke no English apart from what they had learned in school. There were a few Chinese American and Chinese Canadian parents who simply wished for their children to experience China in their formative years, but by and large most of the children who had foreign passports were those whose parents had given birth to them while present in a foreign country. It’s a strange situation, to say the least. As you’d expect, there were many parents who seemed to be actively gaming the birthright citizenship systems that had been established by certain foreign governments. These types of parents had no desire for their children to become foreign citizens in anything other than name only. Many of those I spoke to said the main reason they did this was because their child’s passport would allow their child to more easily access American higher-education. Among those, several said they didn’t plan for their child to visit the United States until it was time for them to attend college, creating beginnings of a class of American citizens who had absolutely no connection to the United States apart from their passports. However, there were also those families who had a genuine interest in permanently relocating to somewhere outside of China. They did so for a variety of reasons, both ideological and economic, but what set them apart from the parents who I felt were deliberately gaming the system was a greater sense of authenticity and a genuine interest in the world outside their own borders. They were proud of being Chinese, but not so proud that the problems their country faced were obscured by knee-jerk nationalism. They were also extremely proud of the country that had “adopted” them and, similarly, were still capable of viewing the issues their new country faced objectively from the vantage point of a former outsider. At this point, I don’t think too many people are aware of this practice, but I imagine that in 15 years when many of these kids are filling up slots in American universities normally reserved for American citizens residing within the United States, it will become an issue. Can you offer any insight into this practice, Yaxue? Apart from the one or two articles I’ve read about this practice and the conversations I once had with parents, I hardly know anything about this underground industry. I don’t know any more than you do, NiubiCowboy. But I did find this article (http://behindthewall.msnbc.msn.com/_news/2011/06/16/6872357-the-trials-and-tribulations-of-chinas-anchor-babies) on NBC site about the matter and it provides some more links. According to my google search, approximately 5,000 pregnant Chinese women give birth in the US via tourist visa each year, and in Shanghai alone, there are more than ten such agencies to take care of the whole process for clients. And this industry has been going on in earnest for good several years already. What makes me roll my eyes all the way to the back of my skull is that, when this babies are back to China, their parents have to game the Chinese system too to get them hukou and Chinese citizenship; without them, they will experience a lot of inconvinences. Since China does not allow dural citizenship, they have to hide their child’s American citizenship at the same time. Good article except for the second to last paragraph. Though you can argue about whether or not it’s a good deal for the student, and I’m sure some of them are scams, by and large those “work and travel” short-term programs are legitimate. At the very least they are in a totally different class from the diploma mills. There isn’t any misrepresentation of credentials. A good read. Wrote about it fleetingly on my page and appreciate the comprehensive coverage you provide.